The compact Series 16C Temperature Controller offers accurate temperature measurement and control in a 1/16 DIN package. Designed for direct or reverse acting (cooling or heating) control, the Series 16C can be programmed for simple ON/OFF or more complex PID control functions. PID control is supported with manual or autotuning. Select relay, voltage or current output for control methods. 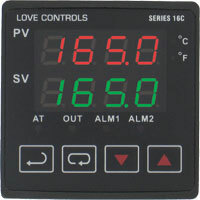 The Series 16C accepts a variety of thermocouple and RTD inputs. Process value and setpoint value are displayed simultaneously on the large dual LED. Auto-tuning, engineering units (Â°F or Â°C), and alarm status is also indicated on the faceplate. Two alarm outputs are included on the unit with 12 preprogrammed alarm functions.